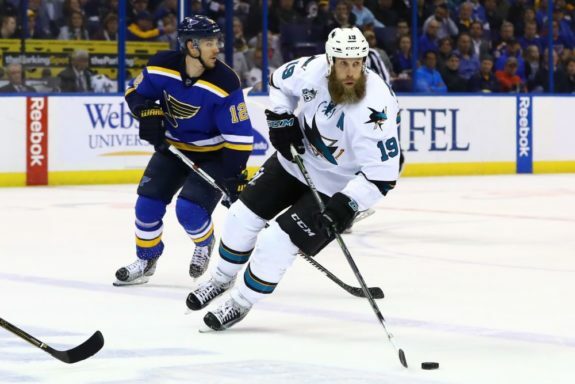 Should the Leafs Target Joe Thornton? During the 2016-17 campaign, the Toronto Maple Leafs iced one of the NHL’s youngest teams. In fact, the Leafs’ average age of 26.7 years was the seventh-lowest in the entire league – trailing clubs such as the Columbus Blue Jackets, Winnipeg Jets, and Edmonton Oilers. Despite being a youthful team founded largely upon raw skill, speed, and unpredictability, Toronto arguably enjoyed its greatest success in nearly a decade’s time. Projected to miss the postseason entirely and conclude the season as one of the league’s least successful teams, the Leafs instead flourished, defeating a number of elite squads on its way to a first round matchup with the Presidents’ Trophy-winning Washington Capitals. Although Toronto would ultimately drop said series in six games, the Leafs’ shocking playoff berth not only afforded a glimpse into the team’s bright future but also provided the organization’s young stars with invaluable experience. However, Toronto’s postseason loss also magnified a number of critical issues within the franchise – most notably the team’s lack of depth. Not only were the Leafs thin on the blue line but they were also unable to draw crucial, timely depth scoring from their forwards when it was needed the most. With a number of valuable skaters approaching free agency and the expansion draft looming, what changes should Toronto make in order to address these issues? Well, expected to ice a relatively inexperienced squad once again in 2017-18 and in need of more consistent depth production, it could be time for the Leafs to consider acquiring a feisty veteran with plenty left in the tank. One of the NHL’s most lethal and consistent playmakers over the past two decades, Joe Thornton is slated to become an unrestricted free agent on July 1, 2017. While the San Jose Sharks will certainly remain interested in Thornton’s services, so too will a number of other organizations looking to add size, experience and scoring ability to their existing lineup. Fresh off of a three-year, $20.2 million contract, Thornton will undoubtedly be looking for a multi-year deal in free agency and one which would provide him with security as he heads towards retirement. At the age of 37 and soon to turn 38, the hulking center would love to earn roughly the same as he did this past season, however, Thornton will surely have to sustain a reduction in pay if he wishes to earn a multi-year deal. Further emphasizing Thornton’s presence in this year’s free agent class is, well, just how weak the coming class projects to be. With no elite free agent soon to be fielding offers, teams will likely have to overpay in order to acquire skaters of specific or even decreasing skill. Fortunately, Thornton falls into neither category, as the veteran center’s durability and proven production should push the Leafs even harder to secure his services. Nearing retirement and quickly approaching 40 years-of-age, many would be quick to assume that Thornton has little left in the tank and therefore would be of little value to Toronto. However, Thornton’s play in recent years has suggested otherwise, as not only has his good health persisted but Thornton has remained incredibly productive and consistent. Sure, he only recorded 50 points this past season, but in the two years prior the London, Ontario, native combined for 147 points in 150 games played – a remarkable pace and an indication of his persistent productivity. What drives Thornton to continuously excel you ask? Well, despite all of the success he has enjoyed, Thornton has yet to secure a Stanley Cup Championship. A guaranteed Hall of Fame inductee and, simply put, one of the greatest playmakers in NHL history, Thornton has seemingly done it all in the NHL yet has failed, to date, to win a league championship. In 2015-16, Thornton did come painfully close to doing so, yet quite obviously came up short to Sidney Crosby and the Pittsburgh Penguins. Of course, Thornton is nearing the end of his incredible career, yet his determination to hoist the Stanley Cup will certainly ensure he plays at a high a level throughout the next few seasons. Unfortunately, the last years of his NHL tenure may not come in San Jose, as the team appears to be trending downwards and stands poised to lose a number of integral core players. Further, with very few draft picks and no high-end talent developing, the Sharks appear to be reaching the end of their current period of contention. So, although the Leafs are an incredibly young team, they appear, arguably, closer to a Stanley Cup Finals berth than the Sharks – a major reason, amongst many, why Toronto should be a major player for Thornton’s services. As mentioned, the Leafs are quite clearly on the rise, with their shocking berth in the 2016-17 NHL Playoffs a major indication of which. Despite possessing very little experience as a team, Toronto is quickly and astonishingly growing into a lethal offensive squad with oodles of potential. Yet, as discussed, the Leafs must add considerable depth and experience to their existing roster if they truly wish to contend for Lord Stanley’s mug. Fortunately for the Leafs, Thornton’s career is defined by both experience and consistent production. With nearly 1500 regular season games as well as 160 playoff contests under his belt, Thornton carries invaluable experience as well as a winning culture wherever he goes. 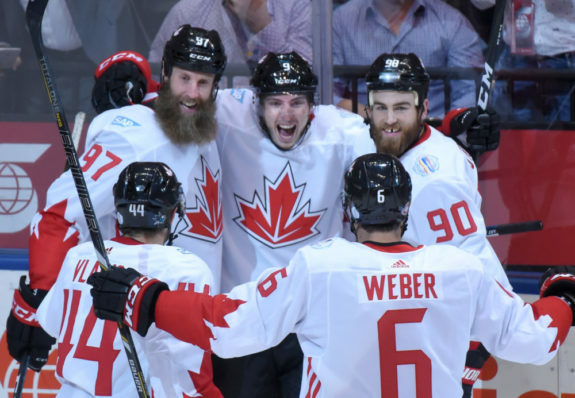 A member of the triple gold club having won the World Junior Championship, World Cup of Hockey and Olympic Gold for Canada, Thornton’s understanding of the sacrifices and hardships necessary to endure in order to achieve success would serve as integral teaching points for a young Leafs squad. Outside of his wealth of experience and immense success, Thornton is also a consistent offensive producer whose game fails to waver. 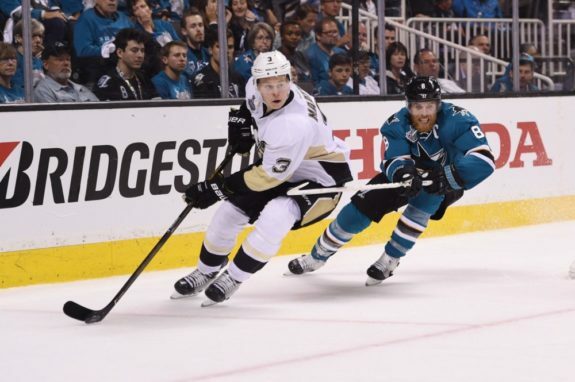 A three-time 100-point scorer and playmaking machine, Thornton’s ability to produce on a consistent basis has made him a highly valuable and persistent threat throughout his 20-year professional hockey career. Having recorded greater than 50 points in each and every season dating back to the 1999-00 campaign – with the exception of lockout years – Thornton has long been one of the most reliable and potent forwards in the NHL. So, why would experience and consistency make Thornton a perfect fit in Toronto? Well, not only were the Leafs interested in Thornton’s services in 2014, but they are currently thin in both of these categories, as not only are the ‘Buds a young and largely unseasoned team but they lack dependable depth scoring. In 2016-17, Toronto iced a handful of full-time rookies as well as a number of others who carved their first grooves in NHL ice. 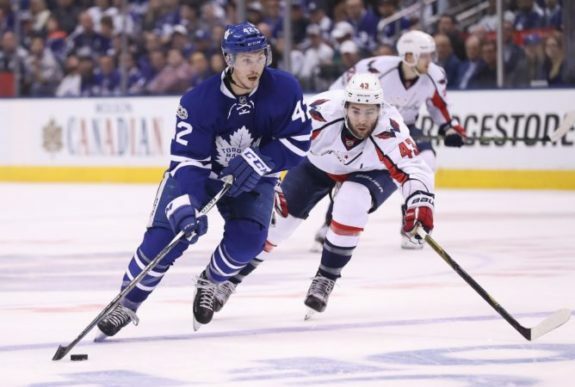 Further, the likes of Tyler Bozak, James van Riemsdyk, and Leo Komarov, despite collecting notable point totals, were inconsistent throughout the campaign and as such were scarcely called upon when needed most. Ultimately, adding Thornton would immediately address both of these issues. Not only would Thornton bring immense experience and accountability to a young Toronto team, but also an injection of reliable depth scoring. If So, Who Stays and Who Goes? If the Leafs are successful in acquiring Thornton’s services, roster moves would quite obviously need to be made. At the moment, Toronto holds Auston Matthews, Nazem Kadri, and Bozak down the middle of the ice. As one of the best centers in NHL history, Thornton would clearly need to fill one of these roles, meaning one of Kadri or Bozak would be on the move. However, given Kadri’s recent six-year contract extension, it goes without saying that Bozak would be the odd man out. Yet, signing Thornton and, in turn, trading Bozak could simply be an acceleration of the Leafs’ future plans as an organization, as Bozak is, in fact, slated to become an unrestricted free agent following the 2017-18 season. Arguably at the height of his value as an individual player, dealing Bozak prior to the coming campaign would not only open up a roster spot for Thornton but reduce Toronto’s cap crunch in the process. Further, given Bozak’s high value in a potential trade, the Leafs would more than likely be able to acquire a quality young prospect in return who could subsequently take Thornton’s place following his retirement. So, signing Thornton would no only be of immense benefit to Toronto and their success as an organization on the ice but it would also kick-start a natural yet necessary overhaul of the team’s depth lines in doing so. As we have seen, signing Thornton would be a massive benefit for the Leafs. Not only would the feisty veteran provide terrific leadership, depth scoring and a heightened level of accountability, but he would ignite natural yet necessary changes within Toronto’s overall roster. However, there is one final aspect which must be seriously considered and that is Thornton’s potential contract with the Leafs. 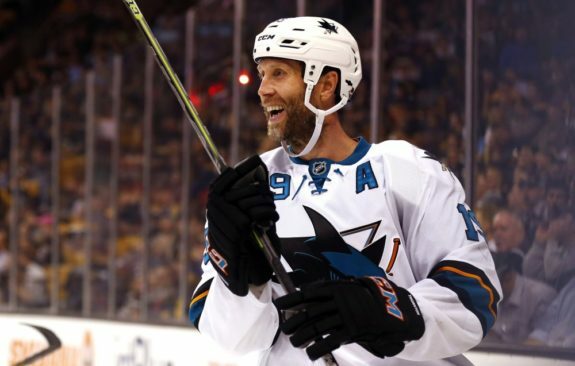 As we discussed, Thornton earned $6.75 million annually during his three-year contract with the Sharks – a deal which was, at the time, fairly similar to that of Patrick Marleau, Patrice Bergeron, and Ryan Kesler. However, given Thornton’s age and skill-set, the veteran will surely have to take a pay cut in order to land a multi-year deal. 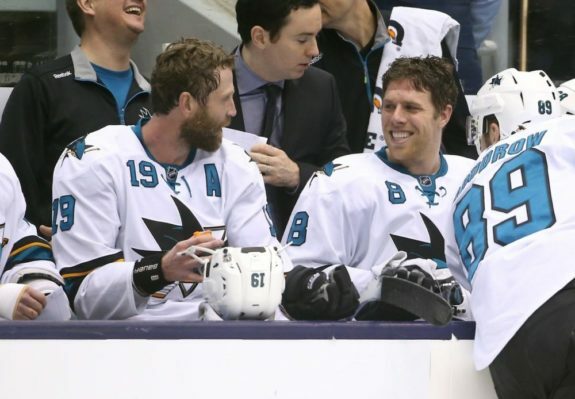 Simply put, Thornton can no longer demand a lucrative deal of an immense salary or long contract term. As such, if Toronto and Thornton hope to come to a deal, the two parties will likely be looking at a two-year deal in the range of $3.5-5 million per season. If the Leafs and Thornton agree to such a deal or one similar, it would likely ensure Thornton’s presence within Toronto’s lineup for the considerable future. Moreover, such a contract would fit well into the Leafs’ current cap situation. 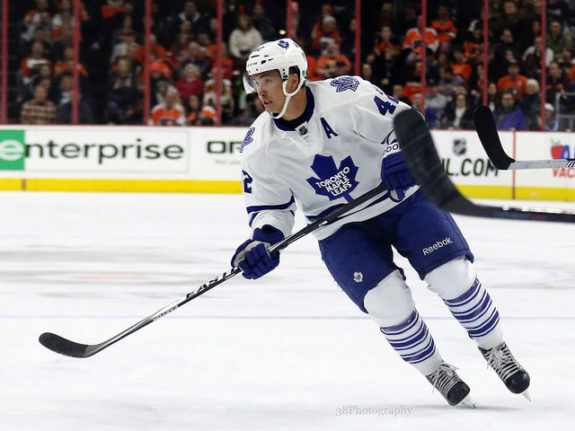 With both Bozak and van Riemsdyk projected to be off of the organization’s book following the 2017-18 season – if not traded – Thornton’s short-term deal would ensure the presence of an experienced scorer as well as greater financial flexibility for the team as they aim to sign their budding young stars. Ultimately, although signing Thornton is likely more of a long shot than a realistic possibility, it goes without saying that the Leafs would be wise to seriously consider the veteran center’s services. A strong, physical player who can dominate the puck below the goal line, Thornton would immediately add depth scoring and a level of experience previously void within Toronto’s roster. Further, as a highly successful player with a history of prosperity, Thornton would be an excellent leader as well as a reliable force on either the Leafs’ second or third line. Of course, one could argue that bringing in an aging player such as Thornton is counterproductive to Toronto’s direction as a franchise, however, the positives seem to far outweigh the negatives in this situation. As one of the best playmakers in NHL history, Thornton certainly has plenty of gas left in the tank and his desire to win the Stanley Cup could very well result in some of the finest play of his astonishing career. Yes, the Leafs are focused on speed and skill, however, the addition of Thornton and his skill-set would create a unique dynamic within Toronto’s roster. Although he may not be the flashiest player, Thornton is a competitive beast whose passion for the game is unrivaled – a fact which would certainly sit well with Toronto’s young guns. Therefore, if the price is right and Thornton is willing to leave the west coast, the Leafs should absolutely consider signing the crafty playmaker, as his long admired experience, consistency and devotion to the game could be invaluable to Toronto’s future success.